Snoop Dogg is in Toronto this week to help celebrate NBA All-Star Weekend, and in between taking part in charity games and events, he found time to have a little fun with the local media yesterday (February 11). 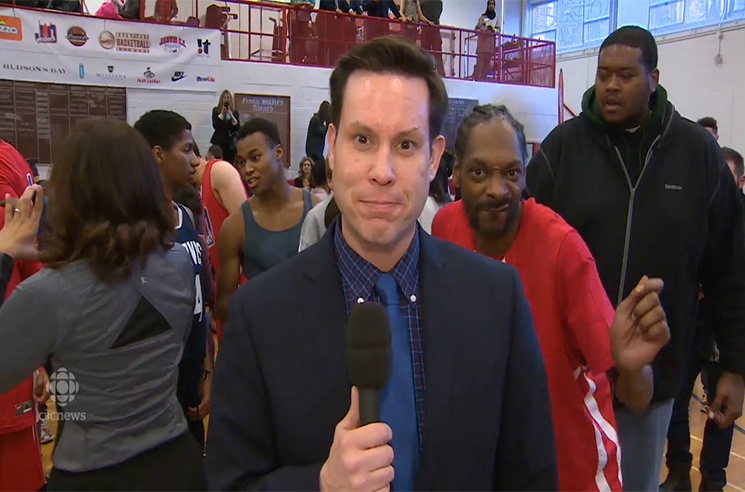 CBC Toronto reporter Greg Ross was recording a promo for All-Star Weekend coverage at Jarvis Collegiate Institute where Snoop was taking part in a charity game for READ60 Poetry Jam, raising funds for books for Toronto District School Board students. Noticing the camera, the Doggfather decided to bust a move for the viewers while the camera operator kept the tape rolling. Watch the amazing photobomb in the player below.